VICTORIA, British Columbia, Canada, August 7, 2017 (ENS) – Hot and dry, the interior of British Columbia is ablaze with wildfires that have driven tens of thousands of residents from their homes and filled the skies over the province with smoke. There are 125 wildfires burning across the province, and Chief fire information officer Kevin Skrepnek said officials are anticipating thunderstorms with lightning and little rain. With no relief in sight in the weather forecast, B.C.’s wildfire emergency is expected to continue over the next few weeks. To ensure that adequate resources are available to continue in the fight, more international personnel are on the way. Over the next week, more than 400 firefighting staff from New Zealand, Australia, Mexico and the United States will join the over 3,800 personnel currently working throughout the province to respond to the ongoing wildfires. This will be a mix of specialized support staff, including incident management teams, and highly trained and experienced wildland firefighting crews. They will join over 3,150 personnel from British Columbia as well as over 630 other out-of-province personnel who have been working tirelessly to protect the province’s communities and infrastructure. 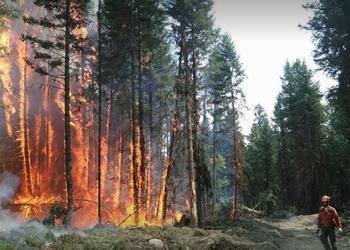 These firefighters are trained to the standards of the Canadian Interagency Forest Fire Centre. The cost of bringing in the international personnel will be covered by the Province of British Columbia. The hot, dry weather conditions have caused a high-to-extreme fire danger rating throughout B.C. 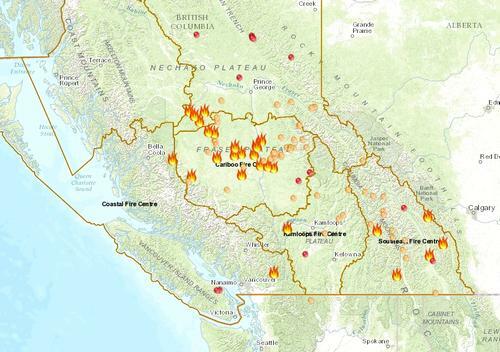 Firefighting crews are on standby in all six of B.C.’s fire centers in preparation for an anticipated increase in fire starts over the next few days due to unsettled weather in the forecast that may bring lightning. BC Parks, in co-ordination with the BC Wildfire Service and Recreation Sites and Trails BC, closed backcountry access to some areas of Wells Gray Provincial Park, effective Saturday, August 5, to help protect public safety. Members of the public will still have access to most of the major day-use sites in the highway corridor through the park, plus campgrounds and marine campsites. All other areas of the park are now closed to public access indefinitely. This partial closure is being implemented to reduce the number of people in the park, since locating and safely evacuating the numerous users who visit the park each day would be extremely difficult in an emergency situation, officials say. Supervised, commercially guided groups will continue to have access to the park unless conditions deteriorate further. This year to date, the Canadian Interagency Forest Fire Centre reports that 886 fires have consumed 591,227 hectares across the province. The extreme wildfire situation is testing British Columbia’s new provincial government, alliance of the New Democratic Party and the Green Party headed by Premier John Horgan, which took office on July 18. Premier Horgan has pledged his ongoing support for the people and communities affected by wildfires. “When we face difficult times, people and communities come together to help each other. Our government is stepping up our support of the people affected by the devastating wildfires in the B.C. Interior,” he said. The Province has extended the state of emergency to ensure a coordinated response to the wildfires, and has committed to provide ongoing direct financial support to evacuees. The current one-time $600-per-household funding will be renewed every 14 days on an ongoing basis until evacuees return home. “The most important thing right now is ensuring that the communities affected by the fires have all the resources they need. Moving forward, the B.C. Green caucus will champion policies that will mitigate the risks of a changing climate to ensure that British Columbians and their homes are protected,” Weaver said. Poor air quality is persisting across the southern half of British Columbia, causing an increase in the number of people seeking medical help. Dr. Bonnie Henry, a deputy provincial health officer, told reporters Saturday that there has been a recent rise in emergency calls and hospital visits with people suffering from respiratory and other health conditions related to the smoke and heat, particularly in the Metro Vancouver area. “Depending on the day and the time of day, the increase can be from 20 percent to 50 percent more than we’ve seen in the past 10 years in the same area,” Henry said. Although a brutal heat wave across the west coast of B.C. and the western United States ended Saturday, Environment Canada has not lifted an air-quality advisory from eastern Vancouver Island to the Alberta border and as far north as Prince George. Metro Vancouver is also maintaining its air-quality advisory.